405 Beacon is located on the south side of Beacon, between Gloucester and Hereford, with 403 Beacon to the east and 407 Beacon to the west. 405 Beacon was designed by Snell and Gregerson, architects, and built ca. 1867, as the home of artist William Morris Hunt, one of five contiguous houses (401-403-405-407-409 Beacon). James Gregerson, whose firm designed the houses, lived at 403 Beacon. On May 30,1866, Robert Pratt sold the lot where 403 Beacon would be built to James Gregerson, and on September 18, 1866, he sold the lot where 405 Beacon would be built to William Morris Hunt. He retained the other three lots until after the houses were built. Click here for an index to the deeds for 405 Beacon. After the house was completed, William Morris Hunt and his wife, Louisa Dumaresq (Perkins) Hunt, made it their Boston home. They also maintained a home in Milton. William Morris Hunt was an internationally-acclaimed painter, considered by many as one of the greatest American artists. In November of 1872, his studio on Summer Street was destroyed in the Great Boston Fire, and many of his works and those he had collected from his friends (notably Jean-Francois Millet) were destroyed. On March 23, 1869, William Morris Hunt transferred 405 Beacon to Robert Codman, who was trustee for Louisa (Perkins) Hunt under the will of her father, Thomas Handasyde Perkins, Jr. The Hunts separated in 1874 and he died in September of 1879. On April 20, 1880, Robert Codman transferred 405 Beacon to Louisa Hunt to hold in her own name. After their separation, Louisa Hunt continued to live at 405 Beacon until about 1880. She also continued to maintain a home in Milton. 405 Beacon was not listed in the 1881 Blue Book. By the 1881-1882 winter season, 405 Beacon was the home of George F. Wilde and his wife, Julia (Cabot) Wilde. They previously had lived at 78 Charles. He was a commission merchant and ship broker. 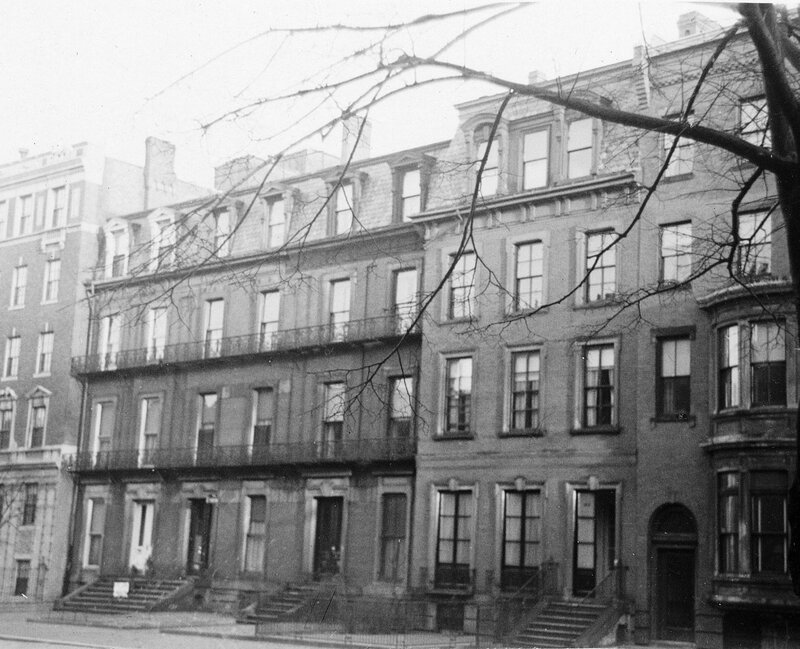 They continued to live at 405 Beacon in 1884, but had moved to New York City by 1885. By the 1884-1885 winter season, it was the home of Dr. Samuel Jackson and his wife, Katherine (Kate) Henshaw (Baury) Jackson. He was medical director for the US Navy. 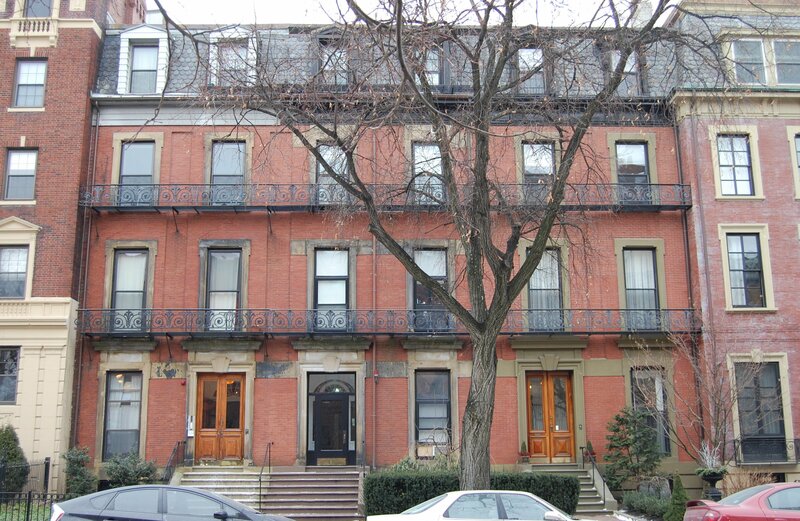 They continued to live at 405 Beacon during the 1886-1887 winter season, but moved thereafter to 381 Commonwealth to live with their son-in-law and daughter, Charles S. Andrews and Katherine (Kate) Henshaw (Jackson) Andrews. On November 17, 1886, 405 Beacon was acquired from Louisa Hunt by Mrs. Eloise Lloyd (Strong) Derby, the widow of attorney Elias Hasket Derby, and their surviving sons: Dr. Hasket Derby, Dr, Richard Henry Derby, and Nelson Lloyd Derby. Hasket Derby, an oculist and ophthalmologist, and his wife Sarah (Mason) Derby, lived at 352 Beacon, Richard Derby, also an oculist and ophthalmologist, and his wife, Sarah Coleman (Alden) Derby, lived in New York City. Nelson Derby, who was an architect by training, was a wheat and grain farmer in the Dakota Territory and was unmarried. 405 Beacon became the home of Eloise Derby and her unmarried daughter, Lucy L. Derby. They previously had lived at 166 Charles. On October 23, 1888, Lucy Derby acquired Richard Derby’s interest in 405 Beacon. Nelson Derby died in May of 1888, and one-third of his interest was inherited by his mother and his brothers, Hasket and Richard. Eloise Derby died in January of 1892. On March 9, 1892, Richard Derby transferred his remaining interest in 405 Beacon (inherited from Nelson Derby) to Lucy Derby, on October 26, 1892, Hasket Derby transferred his interest to Lucy Derby, and on March 23, 1893, the estate of Eloise Derby transferred its interest to Lucy Derby. Lucy Derby continued to live at 405 Beacon. In August of 1895, she married Rev. Samuel Richard Fuller and they lived at 405 Beacon after their marriage. S. Richard Fuller was a clergyman at the time they married, but appears to have retired by the mid-1900s. Lucy Fuller’s niece, Caroline Abbott Derby (daughter of Lucy Fuller’s deceased brother, George Strong Derby), lived with them through about 1900. The Fullers continued to live at 405 Beacon until about April of 1902, when they moved to London for several years. By the 1903-1904 winter season, 405 Beacon was the home of Edward Standish Bradford and his wife, Mary (Slater) Bradford. A retired cotton manufacturer, Edward Bradford served as State Treasurer from 1900 to 1904. They had lived at the Hotel Brunswick (southeast corner of Boylston and Clarendon) in 1902 and also maintained a home in Springfield, where he had served as Mayor in 1889-1891. They continued to live at 405 Beacon in 1905. 405 Beacon was not listed in the 1906 Blue Book. By the 1906-1907 winter season, it was the home of Mrs. Susan (Tiffany) Player, widow of lawyer John Preston Player, and their son, Preston, a mechanical and electrical engineer. They previously had lived at 239 Marlborough. By the 1907-1908 season, they had moved to 375 Beacon. 405 Beacon was not listed in the 1908 Blue Book, but by the 1908-1909 winter season, the Fullers were once again living there. They continued to live there during the 1917-1918 winter season, and also maintained a home in Paris. By 1920, they were living in Washington DC. 405 Beacon was not listed in the 1919 and 1920 Blue Books. On June 26, 1920, 405 Beacon was acquired from Lucy (Derby) Fuller by unmarried sisters, Mary Elizabeth Adele McAleer (MacAleer) and Anna Theresa McAleer (MacAleer). In October of 1920, Mary McAleer applied for (and subsequently received) permission to convert the stable at the rear of the property into a garage. Anna McAleer died in March of 1922. Mary McAleer continued to live at 405 Beacon until her death in December of 1924. After their deaths, 405 Beacon was inherited by their sister, Helena Constance (McAleer) Willis. She and her husband, James Franklin Willis, a real estate dealer, lived in Brookline and leased the property to others. The property remained assessed in the name of Mary and Anna McAleer, who are shown as the owners on the 1928 and 1938 Bromley maps. During the 1925-1926 and 1926-1927 winter seasons, 405 Beacon was the home of Henry Maynard Rees and his wife, Eliza Pugsley (McKeehan) Rees. They previously had lived at 110 Marlborough. A physician by training, he was an executive with a bearings manufacturing company. He later would become an investment broker, and, later still, director of medical research for the John Hancock Life Insurance Company. By the 1927-1928 season, they had moved to 61 Marlborough. 405 Beacon was not listed in the 1928 Blue Book. During the 1928-1929 winter season, 405 Beacon was the home of Miss Adele Villard. She previously had lived at 24 St. Mary’s Street. By the 1929-1930 winter season, 405 Beacon was the home of Miss Francena Fuller, who operated it as a lodging house. She previously had lived in Brookline. By 1934, she had been joined by her sister, Caroline Fuller. They continued to live at 405 Beacon, and operate the lodging house, until about 1946. By 1947, they had moved to 247 Marlborough. By 1947, 405 Beacon was the home of Adah DeWitt (Sanford) McMurrough, the widow of John Lawrence McMurrough, who operated it as a lodging house. She previously had lived at 38 Fairfield. Her son, Eliot Sanford McMurrough, lived with her. He was an artist and later would establish an art school in Flordia, where he was recognized as the founder of Brevard’s art colony. In June of 1948, Eliot McMurrough purchased 185 Beacon and he and his mother moved there. He married in 1950 to Eleanor Russell and Adah McMurrough moved back to 405 Beacon. She had moved from there by 1951. 405 Beacon continued to be a lodging house through the 1960s with various operators. J. Franklin Willis died in April of 1940 and Helena (McAleer) Willis died in March of 1960. On April 13, 1961, 405 Beacon was acquired from Helene Willis’s estate by Michael J. Torchio, trustee of the Pleasant Realty Trust. On December 7, 1962, 405 Beacon was acquired from Michael Torchio by Heyward Lothrop Leavitt, Jr., who continued to operate it as a lodging house. 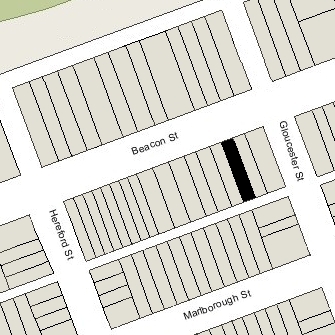 He lived at 311 Marlborough, where he also operated a lodging house. He was proprietor of The Newbury Boutique, an antiques store at 252 Newbury. On April 19, 1969, 405 Beacon was acquired from Heyward Leavitt by Priscilla P. Hill and Sidney R. Handler, trustees of the Beacon Realty Trust. They continued to operate it as a lodging house. 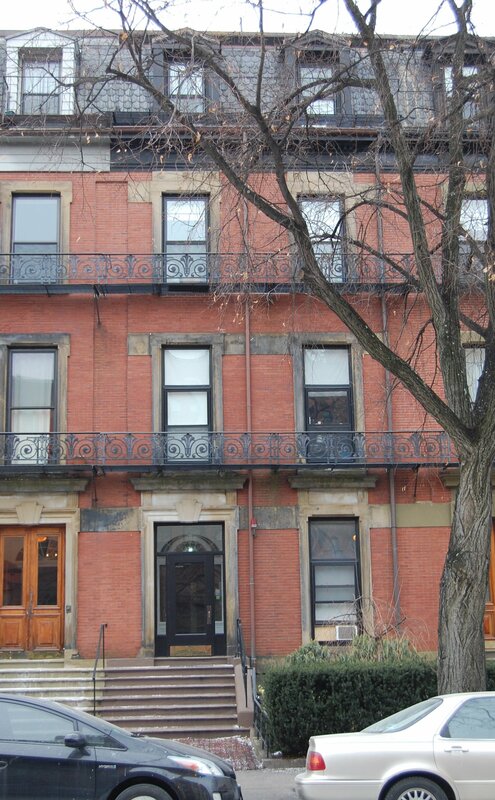 On September 24, 2008, they transferred the property to the 405 Beacon Street LLC. 405 Beacon remained a lodging house in 2015.